Egypt’s military chief Abdul Fattah al-Sisi has resigned in order to stand for the presidency. 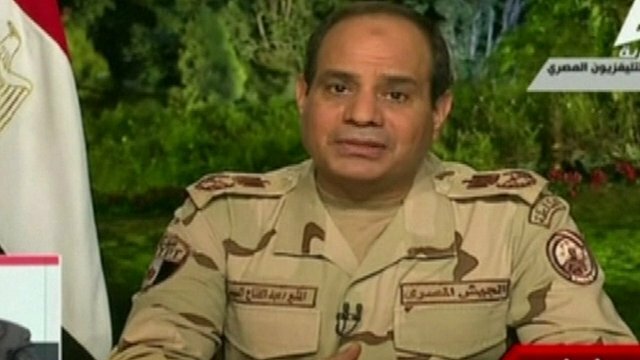 In a widely expected announcement, Field Marshal Abdul Fattah al-Sisi said on state TV he was appearing “in my military uniform for the last time”. Abdul Fattah al-Sisi, 59, led the overthrow of Islamist President Mohamed Morsi in July 2013 after mass opposition protests. Correspondents say he is likely to win the presidency, given his popularity and the lack of any serious rivals. To his supporters, Abdul Fattah al-Sisi is a saviour who can end the political turmoil dogging Egypt since 2011 when a popular uprising ended Hosni Mubarak’s three decades of one-man rule. But his opponents hold him responsible for what human rights groups say are widespread abuses, and fear that he wants a return to authoritarianism. Abdul Fattah al-Sisi’s announcement came hours after Egypt’s interim authorities ordered the prosecution of 919 suspected Islamists and days after 528 were sentenced to death in a separate case. The starting date of the nomination process for the presidential election will reportedly be announced on Sunday, after which no changes may be made to the electoral roll. The government has yet to set a date for the vote, although earlier this month al-Ahram newspaper cited interim President Adly Mansour as saying that it would be completed by July 17. Leftist politician Hamdeen Sabahi, who came third in the 2012 election, is the only other candidate to have declared his intention to run. General Sedki Sobhi, the current chief-of-staff of the armed forces, is expected to be named Field Marshal Sisi’s successor. If Abdul Fattah al-Sisi becomes president, he will be the latest in a line of Egyptian rulers drawn from the military; a line only briefly broken during President Mohamed Morsi’s year in office.